Fiber to the home (FTTH) is the delivery of a communications signal over optical fiber from the operator’s switching equipment all the way to a home or business, thereby replacing existing copper infrastructure such as telephone wires and coaxial cable. Fiber to the home is a relatively new and fast growing method of providing vastly higher bandwidth to consumers and businesses, and thereby enabling more robust video, internet and voice services. Connecting homes directly to fiber optic cable enables enormous improvements in the bandwidth that can be provided to consumers. Current fiber optic technology can provide two-way transmission speeds of up to 10 gigabits per second. Further, as DSL providers are struggling to squeeze increments of higher bandwidth out of their technologies, ongoing improvements in fiber optic equipment are constantly increasing available bandwidth without having to change the fiber. 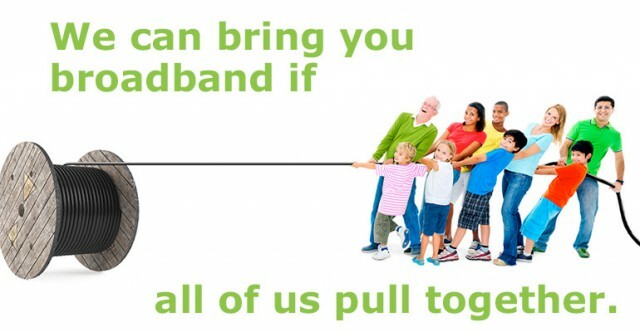 That’s why fiber networks are said to be “future proof." 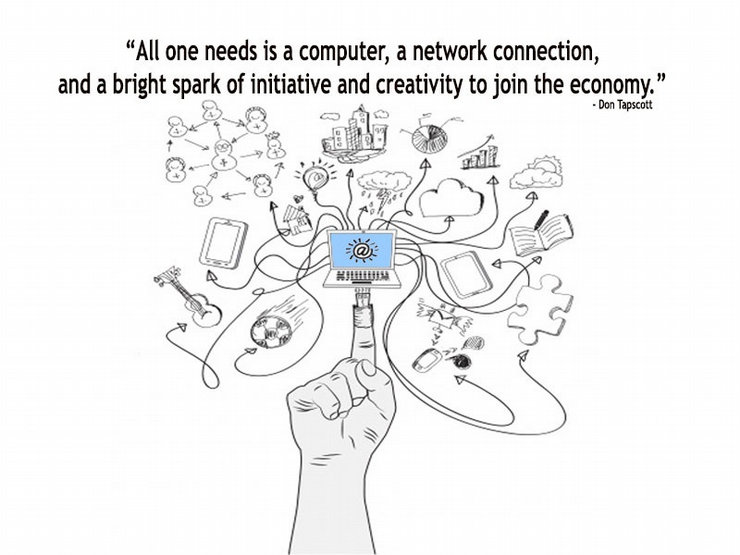 Fiber-optic technology is the future-proof way to get Internet, TV and home phone service in a residence or business. And with FiberCast fiber-optic Internet, download speeds can reach up to 1 Gbps. 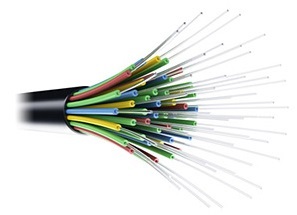 Fiber-optic communication uses fiber-optic cable networks to provide superior Internet, TV and home phone services to those provided by traditional copper-wire networks. Fiber-optic Internet providers and subscribers alike benefit from the technologically advanced and superior quality of fiber-optic communication systems, like the FiberCast network. 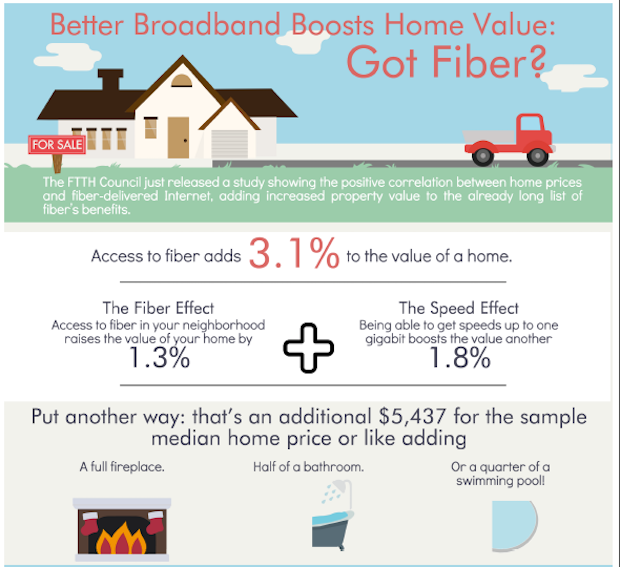 During FTTH Connect 2015 conference, the Fiber to the Home (FTTH) Council Americas released a white paper finding that access to fiber may increase a home's value by up to 3.1 percent. Using the National Broadband Map and a nationwide sample of real estate prices from 2011 to 2013, the study's authors investigated the relationship between fiber-delivered Internet services and housing prices. The boost to the value of a typical home -- $5,437 -- is roughly equivalent to adding a fireplace, half of a bathroom or a quarter of a swimming pool to the home. The study adds to a growing list of others showcasing the consumer benefits from widespread access to fiber broadband Internet. There have been a number of studies linking broadband networks and new investments in such networks to improved economic performance. And the speed and reliability fiber provides offer further benefits. Most recently, in 2014, the FTTH Council released a study finding higher per capita GDP in communities where gigabit Internet was available. Infrastructure investment, job creation, entrepreneurship, and companies relocating or expanding to your city are all manifestations of this growth. Today's study found that, for homes where 1 gigabit-per-second broadband was available, transaction prices were over 7 percent higher than homes located where the highest speed available is 25 Mbps or lower.